Truth is something that can appear to be quite elusive these days. It’s very easy to find half-truths or outright lies, misconceptions, misunderstandings; they are all sitting at our fingertips. So when I find truths that speak to me, that resonate within me in a way that I know in my core this is truth, I try to pay attention. 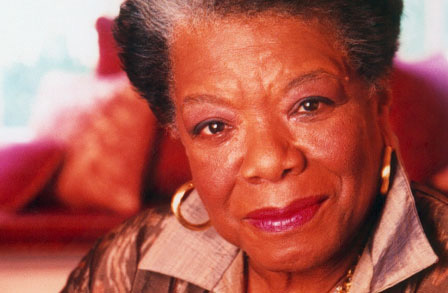 Maya Angelou was someone I had heard of in high school. We may have read a poem or two, if so I honestly don’t remember. It wasn’t until college that I took more of an interest in her, and in reality it’s probably because I saw her on Oprah. I have a tendency to cringe when speech is seemingly deliberate. When I can tell someone has thoroughly thought through what they are saying and they say it in a very matter of fact manner. I don’t know why. But I typically disengage. So to watch Maya Angelou speak and find myself literally on the edge of my seat feeling as though I am being pulled in a little bit nearer to her with each word was extremely unexpected. She spoke in a very deliberate manner, she knew what she was saying, but this time it was different for me. She was speaking in truth. Every word was one I wanted to hear, and I was glad she spoke with such clarity both in pronunciation and in point. And since truth, as I stated can be hard to come by, I wanted to make sure I shared some of it here, by way of Dr. Angelou. I have found this to be true time and time again. Whether it is in a relationship romantic in nature, a friendship, family members, whomever we have in our lives, people will show us who they are. If someone tells you they are mean, believe them. If someone tells you they don’t care, believe them. If they say they just want to have fun, believe them. If they cheat on you, ignore you, make it a point to hurt you, believe them the first time. They are showing you who they are, and they are making it clear they have no intentions of changing this for you. Once a person shows us what they plan to do, and we stick around, then that is our poor choice. They will easily have the chance to say, “well you already knew” and use it as an excuse. And sadly, they won’t be entirely wrong. We have to learn that being a savior is not supposed to be the same as being a victim. So staying somewhere that is harmful to us to stick it out, to be strong, because we love them and we know they love us if we could just get them to change just one more time is never an excuse. We are saving no one and in trying to do so are only creating inequality within the relationship. We must pay attention to what people tell us about themselves and have enough worth about ourselves to be willing to let it go. This quote comes from her essay titled New Directions. And it continues along very well with the previous quote. Many times we don’t leave a situation because we’ve planned out a future in our heads. We have something, and maybe we are only holding on by a rapidly fraying string, but we are holding on. There is something in front of us. But when our vision of the future does not match the reality of our future, there is a problem. If we truly stop and look down the road ahead, which most often will look like the road behind and it in no way is a path we should continue down, we must be willing to stop and change directions. We have to let go. We have to imagine a future that is different. We must be willing to try, and not only once, but as many times as it takes to get us to where the future we are imagining has the capacity to line up with the future coming to life in our reality. Whether it’s a career change, a relationship change, or even family that is harming us, we must care enough for ourselves to forge onward towards better things. And on our path to our new places we must let go of the past, lighten our load and forgive. We must be willing to admit to ourselves that we acknowledge what has happened, we understand that we were deeply hurt whether emotionally or physically, whether from and outside source or something we did to ourselves, we must look at the moment for what it is and find a way to release it. It is the only way to move forward successfully. We cannot let those moments define us. We know that they exist. They aren’t likely to be things that we forget. But they are things that we can move forward from without allowing them to control us. Forgiveness is truly one of the greatest gifts we can give to ourselves. In life we all have choices that we make every day. One of the most important choices we make is how we treat others. None of us were immune to people coming into our lives and making us feel bad. As children someone hurt us. Well, in all likelihood, multiple people. Children can be cruel. Adults can be cruel. We are all humans exposed to other humans, and that means life isn’t always going to be pretty. So each day we must make a choice to treat others the way we truly want to be treated. So we must believe ourselves worthy of the treatment we extend to others. We must know that we have the chance to grow a person, to encourage them or to bring them down, and it is essential that we become growers of others. We know how people made us feel. It lasts. We remember being scared, we remember being hurt, we remember being outcast, feeling alone and desolate, that no one else understands or cares. We remember these things because they made us feel like we didn’t matter. And that is not acceptable. We cannot continue a culture of people whose only goal is to make people feel this way. We must do what we can to acknowledge and accept our own worth and love ourselves enough to recognize and grow this in others. To be encouragers and walk in light so that others may follow. So that we can all know truth. "You can’t get full staring at someone else’s plate"